Successfully Added Digital Video Memo - Fridge Magnet Gadget to your Shopping Cart. Meet the newest 21st century magic gadget, an advanced Digital Video Memo for life in the new era. The Digital Video Memo takes that bold leap into the future and gives you a fridge magnet that you can record a 30 second video message on. Want to leave a message for your spouse or kids, but can't find pen or paper? Or did you leave a message for them on a piece of paper, but the wind blew it away and they never got to see it? Now, you just need to buy this video memo device and stick it on your fridge. Say bye to all your worries!. To operate this video memo, look into the camera lens, press record and start talking. You have 30 seconds to say what you want after which the video memo recording will automatically stop - it’s so simple that even your small children can use it! 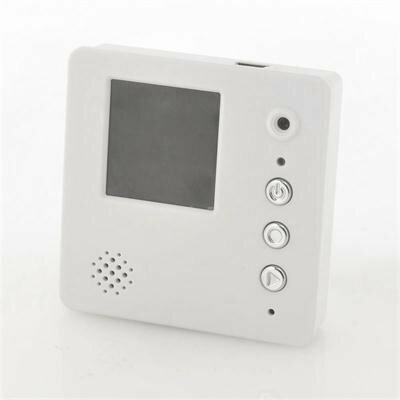 This Digital Video Memo features a built-in video camera, 1.44 inch TFT LCD Display and speaker. And the great re-recordable reminder device can hold a message of utmost importance up to 30 seconds long. When it runs out of power just hook it for a quick recharge via USB and it's good to go again. So, if you want to tell your family that you need go out for while or remind your spouse how much you love them, this Digital Video Memo is all it takes. Just a simple push of the power button and the message plays back whatever essential information the recorder holds. This simple and eco-friendly video memo is available now so click "Add to Cart" today and we'll express ship you a sample to see for yourself how great this digital video recording memo gadget really is. Record up to 30 seconds of video. Only one message can be recorded at a time. Magnetically sticks to any suitable metallic surface - ideal for fridges. How can I access the recorded video file on the video memo gadget? - First make sure the device is switched off. Your computer will not recognize the video memo if the device is connected to your computer when it is turned on. ВИДИОКАМЕРА ХОРОШАЯ.Динамики слабые плохо слышно надо вслушиваться.Один минус нет сигнала что произведена запись и надо ее прослушать.В общем идея с гаджетом хороша и рекомендую покупать. on 2012-06-27 05:40:47 Divertido e prático! Funciona muito bem, pequeno e delicado, show! Faz o que promete! on 2011-03-24 22:01:42 Does what it says!